Part of the Festival of Learning in 2013, this interactive workshop is aimed at anyone who wants to find out more about how to use social media. The half-day activity comprised a half day of demonstrations, workshops and tutorials on different platforms of social media as well as the chance to ask any questions you have, in addition to developing personalised plans for using social media. Participants were encouraged to bring mobiles, tablets or laptops with you to develop their social media usage. On the day, 55 Social media novices enjoyed 3 fun packed hours of social media interactivity on Monday as they listened to explanations of some of the key platforms available before having a go themselves. 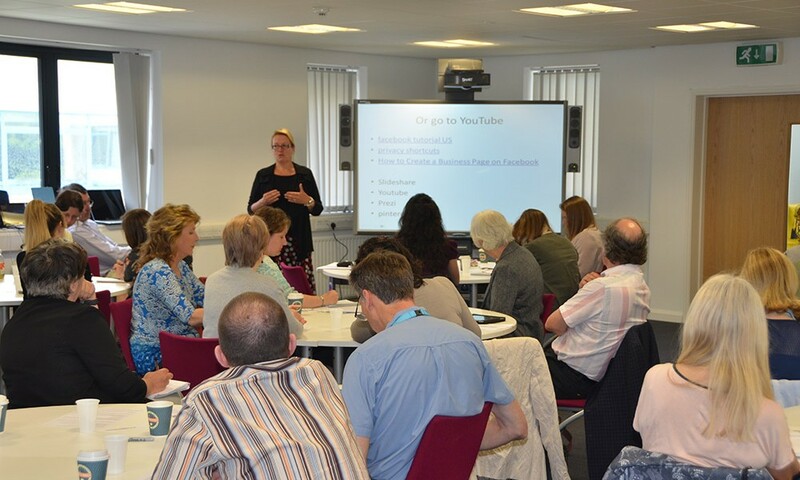 The event, organised by Dr Debbie Sadd, from the School of Tourism included a presentation from the School’s social media assistant Anna Jones, who explained how the School now uses social media on a daily basis through blogs, Twitter and Facebook. Event attendee Nicola reflected that: “This 3-hour event was attended by nearly 50 individuals who were all keen to find out more about social media and social networking. Attendees learnt about the main social networks, what social media can actually enable us to do, and that social networks are the latest form of marketing for individuals and businesses alike. LinkedIn, Pinterest, YouTube, Facebook, Twitter and others were all discussed, but attendees were also made aware of the potential dangers of social media if not used correctly. After an interesting talk by Debbie Sadd, who led the event, attendees were then invited to discuss their particular areas of interest with others in small teams. One team focused on Facebook, another on Twitter, and they used their own devices (phones, tablets, laptops) to explore their area of interest, asking any questions of the experts on hand as they went. In summary this was a very interesting discussion focussing on a topical and, judging by the turn-out, popular subject”.